We are engaged in offering an extensive series of Sand Timer that is available in diverse sizes, shapes and designs to suit many demands of our customers. Weight :0.5000 KgGround Diameter :2.5"Height :6"Volume Weight :0.500 KgColor :Copper AntiqueMaterial Used :BrassUsage :Decorative, Desktop Decorative, Table Decorative, Collectible. Size- Sand timer ht:-12cm & Dia:-6cm & 3 mint We are manufacturer & exporter of sand timer. 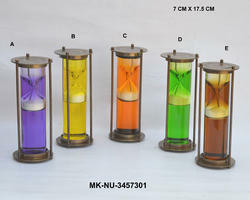 We offer high quality nautical reproduction handicrafts such as sand timers. Fine Decorative Brass Sand Timer In Different Sizes. Made with brass antique Shesem wood box-05 inch size. 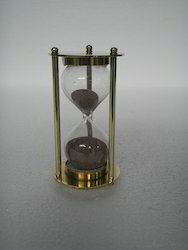 Leveraging on vast infrastructure, we are engaged in manufacturing and supplying an exclusive array of Brass Sand Timer. - Used in houses, clinic, etc. With years of experience and knowledge in this domain, we are offering an exclusive assortment of Brass Sand Timer to our prestigious patrons. The offered product is designed and developed under the supervision of highly skilled and experienced artisans, who make use of latest technique.